As if you couldn’t tell already, the fact is the only current console I own is the Nintendo Wii. Whilst it caters to my need for Retro Gaming, it also seems to be distinctly lacking in rubbish, graphically intensive games such as Medal of Honour 2496. 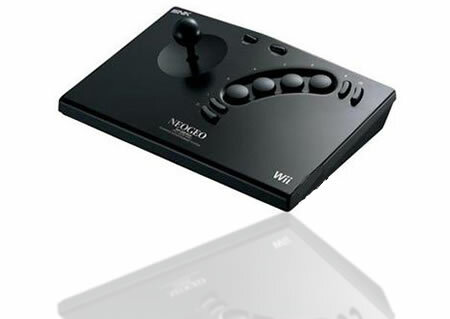 It’s nice therefore that Nintendo have produced two new joysticks to satisfy our lust for Retro Goodness, the first is the Neo Geo Stick, which is based on the stick used for the ridiculously expensive Neo Geo Console, the second is based on the SNES controller. Pics below. They promise accurate control for the Wii, which is nice, as if you’ve ever played Super Metroid or World Heroes on the Wii Classic Controller you struggle. Unfortunately, there still Japan only, so I suggest a campaign on Facebook to get them released in the Western World. Who’s with me? I dont know what you are on about that the classic controller is rubbish! As a owner of a fully working snes (although its smoke stained beyond belief ecause of the fact i used to be a heavy smoker but i love it all the same” and a wii with a classic controller the “classic” is exactly the same as the snes one albeit the two analogue sticks, it feels 99% the same. if anything the wii needs a megadrive style classic controller to “feel” right on sonic and streets of rage. just give the classic controller a chance and download some hard to find titles or just for sin and punishment that is a classic in its own right. Skins: I appreciate what you’re saying but I have a very much strained relationship with the Classic controller. It doesn’t sit right in my hands, it seems to flat and small, and overly responsive analogue sticks, and underly responsive digital sticks. Shame as it’s a nice idea. I would join in your campaign for these being released over here, why do they think Brits would not want these? ?